At the 4-H Day at the Breslin event, we launched the new awareness and recruitment campaign for 4-H in Michigan: 4-H Grows Here. I am excited about this new campaign and wanted to share with you a little bit about it and let you know how important it is. Our Michigan 4-H campaign matches the national campaign launched in 2015 by the National 4-H Council, which illustrates all the positive development skills it fosters in its youth – creativity, courage, teamwork, determination, confidence and more. With a nod to its agricultural roots, the 4-H Grows Here brand also celebrates all the unique and diverse ways 4-H programming has expanded in the past 100 years. If you have a few minutes, watch this great video below that showcases 4-H history and future focus. Michigan is one of a handful of key partners selected by the National 4-H Council to help with the roll-out of the campaign, and we are excited to bring it to life in our state. That we were chosen to help with the roll-out is something to be proud of, and just another reminder of the national prestige that our MSU Extension 4-H staff, volunteers and participants have worked for and achieved. Although the campaign will be used to showcase a number of life skills and traits, Michigan 4-H will join the national movement in 2016 to highlight a key asset 4-H helps to grow: true leaders. In addition to being the theme for the 4-H Day at the Breslin event, 4-H Grows True Leaders will also be the theme of the 2016 4-H Exploration Days. Michigan 4-H will be working throughout the year to highlight the many true leaders in our own state that were grown through 4-H.
Last week, we wrote about how former state director of Michigan 4-H Mike Tate was inducted into the National 4-H Hall of Fame. We also highlighted the accomplishments of several other Michigan recipients, including Janet Blanchard, Leah Ritchie, Arne Kettunen and Russ Mawby. It was brought to our attention that, even though he was not featured on the National 4-H Hall of Fame website, another Michigan recipient was Melvin Thompson, who received the national award in 2012. He worked as a 4-H agent in Monroe County, before taking a role with the National 4-H Council, where he stayed until retirement. He became associate director of 4-H on the national level in 1968, and later was promoted to director of 4-H’s international programs. He served as president of the Michigan 4-H International Association and was president of the International 4-H Youth Exchange Association of the USA twice. A growing population puts an increasing demand on agriculture to feed the world. Who better to look for new ways to solve the problem than our young people? The National 4-H Council and Monsanto recognize the creative minds and natural inclination of youth to help others. The two organizations together created a new initiative to get today’s kids interested and involved in agriculture. The 4-H Ag Innovators Experience will not only spark enthusiasm but also help youth develop skills that would help them succeed in future agriculture-related careers as well as careers in STEM (science, technology, engineering and math). And these future farmers and scientists may be on their way to solving the world’s hunger problem. The 4-H Ag Innovators Experience is being piloted in eight states and Michigan is one of them. Michigan 4-H Youth Development received a $15,000 grant to fund the program. Michigan State University Extension educator Betty Jo Nash coordinates the program for our state. Three teen 4-H members attended training this spring at the National 4-H Youth Conference Center in Chevy Chase, Maryland, just outside of Washington, D.C. The teens will in turn train other teens as well as local 4-H clubs. In the end, a thousand youth will have participated in Michigan and as many as 8,000 are expected to participate in the eight states taking part in the initiative. The pilot program involves the “Fish Farm Challenge.” Participants will engineer a simulated fish-food distribution system using limited resources. Ultimately, they should recognize the value of aquaculture while stimulating innovative approaches to a real-world problem – ensuring farm-raised fish have equal access to food. After completing the challenge, participants can create a video to show their ideas to their local communities. Four winners of $2,500 each will be chosen. Look for further details about the video contest on the National 4-H Council website after June 1. The last two Spotlights offered real-life examples of how some of our Michigan State University Extension colleagues have successfully marketed their curriculum resulting in at least moderate increases in sales of the product in the MSU Extension Bookstore. Today, I’d like to offer my final example. 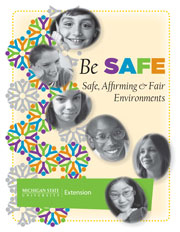 Extension program leaders Janet Olsen and Karen Pace wrote Be SAFE: Safe, Affirming and Fair Environments (HNI101). The curriculum is designed to help young people aged 11 to 14 and adults work in partnership to create environments that are physically and emotionally safe. The curriculum has sold well in the MSU Extension Bookstore with 70 percent of sales coming from outside Michigan. For starters, the two did not just develop the curriculum because the subject interested them. They created it when seeing a need for research-based bullying prevention education within out-of-school time settings. As they created the curriculum, they paid particular attention to research from CASEL (Collaborative for Academic, Social and Emotional Learning), which stressed that effective after-school programs that promote social and emotional learning are sequenced, active, focused and explicit (which also spells SAFE). Making connections between the Be SAFE curriculum design and the findings from CASEL has been an important aspect of marketing the value of the material. Early in the process, they focused on cross-institute partnerships and capacity-building. Although the Be SAFE initiative was developed within the Health and Nutrition Institute Social and Emotional Work Team, they began building connections with staff in the Children and Youth Institute. As soon as the curriculum came off the presses in January 2013, they offered workshops to build the capacity of staff to address issues of bullying within their communities and to use and market the curriculum as a tool for addressing these issues. They also developed flyers designed to make local marketing easy to carry out. They currently offer mini-grants staff can use to help program sites put the curriculum to work. They’ve promoted Be SAFE at a wide variety of youth- and health-related conferences across Michigan and the country. Some of these have been Extension-related (such as the National Extension Conference on Volunteerism and the Priester National Extension Health Conference), and many have been through external groups and organizations (such as Girl Scouts, the Michigan AfterSchool Association and the Childhood Trauma Practitioner’s Assembly). They always provide participants with copies of the curriculum flyer, as well as flyers for additional Be SAFE educational workshops. They always make sure they tell people to download a free PDF of the introduction to the Be SAFE curriculum from the MSU Extension Bookstore site. They also stress that the curriculum is available in multiple formats (print, flash drive and CD-ROM). They’ve offered webinars about bullying topics “bookended” by information about Be SAFE. They’ve marketed these webinars through the local and statewide networks of MSU Extension staff members, as well as through the eXtension website and national Extension youth- and health-related Listservs. The recordings of the webinars are available for purchase through the MSU Extension Bookstore. They use MSU Extension news articles as a marketing tool. As they write news articles about bullying and related issues, they often include a final paragraph that connects with the Be SAFE initiative and that highlights the curriculum. For example, a recent article about cyberbullying included three pertinent links: the Be SAFE program web page, the Be SAFE curriculum page in the MSU Extension Bookstore and the Events registration site for a recent webinar about cyberbullying. They offer continuing education units for their workshops, which helps them reach broader audiences. They have worked with the Michigan Social Work Continuing Education Collaborative to have the Be SAFE-related workshops approved for continuing education hours. This has allowed them to have their approved workshops listed on the collaborative’s website, which is accessed by large numbers of social workers who need ongoing education hours for their licensing requirements. Karen and Janet worked to get Be SAFE included in a nationally sold publication produced by the National 4-H Council titled A Guide to Bullying Prevention Programs. It talks about Be SAFE as an important resource to address issues of bullying. As you can see from all three examples I’ve talked about, trying a variety of marketing methods can lead to successful sales of your product. Find some that work for you. We knew all along that Michigan State University Extension’s 4-H Great Lakes & Natural Resources Camp is a great pre-college program for kids to learn through outdoor hands-on experiences and have fun in the process. Others have noticed as well. In 2008, the annual seven-day camp held on the shores of Lake Huron in Presque Isle, Michigan, was named as a 4-H Program of Distinction. In 2009, it won the National 4-H and U.S. Fish and Wildlife Service Natural Resources Conservation Education Award. In 2011, it was selected out of 70 nominations of promising science programs through a structured process of nominations and vetting as one of eight top science programs in a National 4-H science program in-depth case study. The study was part of the 4-H Youth Development Program’s National Science Initiative evaluation funded by the Noyce Foundation through a grant to National 4-H Council. A new report was recently released on the case study. “Priming the Pipeline: Lessons from Promising 4-H Science Programs,” written by Derek Riley and Alisha Butler from Policy Studies Associates, features the camp and the seven other selected science programs. It covers practices in the following areas: youth outreach and recruitment, staff and science volunteers, professional development, science curricula and pedagogy, youth development and attitudes toward science, partner organizations and resource support, program evaluation, and program sustainability and scale-up. Senior program leader Judy Ratkos serves as camp administrator and co-directs the camp with 4-H volunteer Bob Patterson. Judy said, “It is truly an honor for the staff and volunteers involved in 4-H Great Lakes & Natural Resources Camp to have it recognized as one of the top 4-H science programs in the nation. To have it held up as a model for other youth science programs – both within and outside of 4-H – creates awareness that MSU Extension can help lead the way in increasing science literacy among Michigan young people and increase the number of youth pursuing postsecondary education and careers in science. “The lessons shared in this newly released report should be helpful to other 4-H science programs striving to be ‘SET Ready.’ A SET Ready 4-H experience is a program that is framed in science, engineering and technology concepts based on SET standards and intentionally targets the development of SET abilities and the outcomes articulated by the 4-H SET Logic Model,” Judy said. Congratulations to Judy and her team! They inspire the rest of us to make the best even better. Imagine a 15-year old youth who gets called out to New York City to receive a national award for doing what came pretty naturally to him. Then imagine being that youth on the stage with other honorees, including a famous country singer (Jennifer Nettles of Sugarland) and the executive vice president of a major international corporation (Jim Borel of DuPont). I would have a hard time imagining what it would be like to be that youth, but I got to see Kent County 4‑H member Nate Seese have that experience on Tuesday night when he received the 2012 4‑H Youth in Action Award at the third annual 4-H Legacy Awards Gala hosted by National 4-H Council. I’ve told Nate’s story on several occasions in Spotlight, so today I’d like to spread the spotlight a bit further to tell you a bit about Nate’s family, parents Christine and Kevin Seese and grandparents Jeanne and Louis Kiesling. Youth like Nate don’t just happen, and no one should think that 4-H is what made him special. Obviously it begins at home, and I was honored to meet Nate’s parents and grandparents at the National 4-H Gala. His mother, Christine, was born and raised on a farm in New Jersey. His father, Kevin, has worked in agribusiness on an international stage for much of his career. They actually chose to move to Michigan and to realign their careers so that their children, Nate and Nate’s older sister Hannah, could have a childhood more connected to community, church and the land than they had previously, a childhood much like their parents experienced. It was heartwarming to see that commitment rewarded with their son’s recognition in New York. And then to meet the grandparents who drove up from New Jersey to see their grandson honored was a special treat. Grandfather Louis was a 4-H’er 56 years ago. Jeanne has a wealth of stories about raising kids on the farm. Christine and her siblings grew up working on the farm, and she had some colorful stories to share about planting strawberry seedlings and treating city folk to a rural experience when they visited the family farm. Kevin grew up as a youth active in 4-H. He and Christine specifically sought out 4-H as a program that they thought would help them to raise their children with the values and skills they acquired from their own experiences. And Glenda Kilpatrick, Michigan State University Extension children and youth educator, who has worked with Nate and his club and their leaders, was able to witness the impact of Nate’s choices and actions on others who hear his story. Nate’s a special young man. And I recognize that Michigan 4-H has thousands of young people equally committed to contribute to their communities. Nate has received a great deal of well-deserved attention for his work and each of the other youth in 4-H deserve that recognition as well. I like telling his story because it captures people’s attention so well. I think the only dry eyes in the room when Nate accepted his award were his own. There’s nothing too haughty about this young man. He represents many more youth and I hope to shine the spotlight on others as well. Michigan has a promising future with youth like Nate Seese and the thousands of others we serve through Michigan 4-H.
You can read more about the award Nate received at this summary of the National 4-H Gala. One of the outstanding things about our organization is the way that our partnerships build capacity in community leaders. Bob Thomson, a Sanborn Elementary School teacher in Ossineke, Mich., who works closely with Michigan State University Extension, won a Chevrolet GREEN Educator Award. Through the award, Earth Force and the General Motors Foundation team up to reward educators who integrate quality environmental education into their schools. Bob works with Michigan Sea Grant, the U.S. Fish and Wildlife Service, the NOAA Thunder Bay National Marine Sanctuary, 4‑H Youth Development and Huron Pines AmeriCorps program to guide his students in learning about the Thunder Bay watershed beyond the classroom. The Northeast Michigan Great Lakes Stewardship Initiative (NE MI GLSI) initially supported Bob’s work. This is a regional collaborative network, part of a statewide place-based education programming network supported by the Great Lakes Fishery Trust. Michigan Sea Grant, partnering with 4-H, facilitated the early planning discussions dating back to 2006 in establishing this regional northeastern Michigan network. Today, Sea Grant and 4-H continue to serve as leadership partners in facilitating the NE MI GLSI work in our region. The Toyota-supported 4-H2O Project, a water science and education initiative, supports Bob and his work. The Toyota 4-H2O Project is funded by a grant from Toyota to National 4-H Council and the Michigan 4-H Foundation. Sea Grant and 4-H partners locally, co-coordinating 4-H2O efforts with the help of Extension educators Sienna Suszek and Melanie Chiodini, Extension program associate Tammy Barrett and Extension program instructor Les Thomas. Sea Grant is a direct partner to Bob’s project, supporting Great Lakes fisheries and aquatic invasive species studies conducted with his class. Brandon Schroeder, Northeast Michigan District Sea Grant Extension educator, serves as a resource expert to his class and participates in several of their exploration field trips. Read this fact sheet for details about fifth and sixth grade students from Sanborn Elementary studying the Thunder Bay watershed through the help of these collaborations. These partnerships are great examples of how our work branches out, enabling others in the community to improve lives.